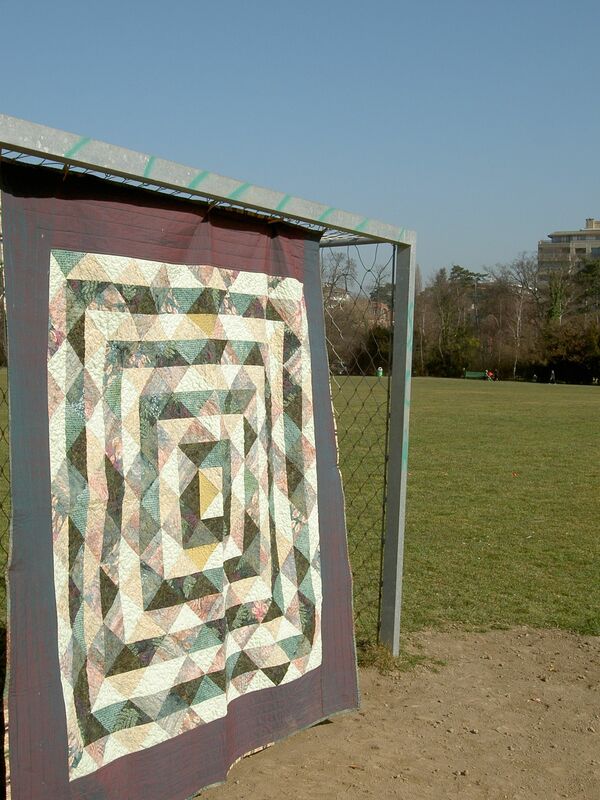 Springtime at last (or rather while it lasts…) and time to catch the sun in the park to photograph this quilt before it goes to its new home over the weekend. I just now noticed the error on the bottom right. Oops. Oh well… It keeps life interesting, I suppose, and reminds us we are mere mortals. The golden silk material in the centre was left over from the cravats my mother made for the men at our wedding (8 years ago, was it?). 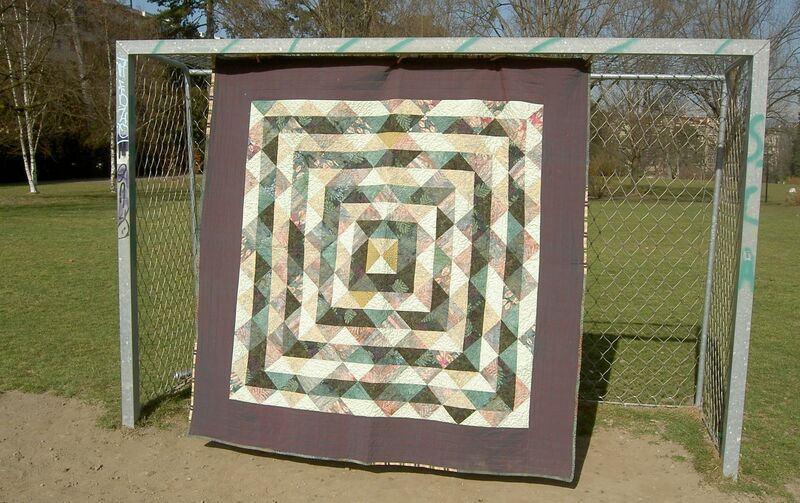 As the recipient of this quilt was there, it seemed like a fun touch. I had a big struggle with the borders as I rather pragmatically sewed them on initially without measuring and inevitably stretched what was an all-bias edge. So I had to unpick the lot. I showed it to the clever person who taught the quilting class I took the other week, and she suggested removing the edges, quilting the whole thing onto the batting and backing, and only then sewing on the four edges. It worked a treat! Unusual, but very effective. I stippled the whole thing in a variegated thread, and the little golden patches in gold. I lost enthusiasm round the edge and just went for straight lines. The back is a hotch-potch of material, some rather batik-ish-looking from that ubiquitous Swedish store, and some bits of sheet to make it up. The batik material I bought here, in Nyon. A nice shop, with a lovely owner, and rare enough occurence in these parts to be mentioned! I tried out all sorts of fancy quilting on the little scraps that I used to make the cushion, but I wasn’t brave enough (or dedicated enough?) 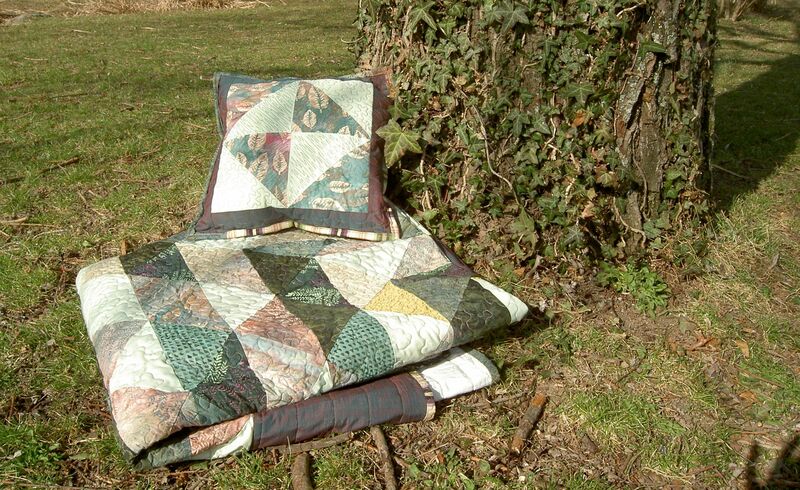 to do this on the quilt. Just as I was celebrating finishing this, and handing in an academic book chapter in one fell-swoop, I got another email from someone else saying “Now that we are within a few weeks of the deadline for the submission of chapters to the Handbook, may I ask if you could send us two electronic versions of your chapter”. Oh NO! There was I feeling all grown-up about managing my deadlines… Dare I admit this next chapter is barely started? 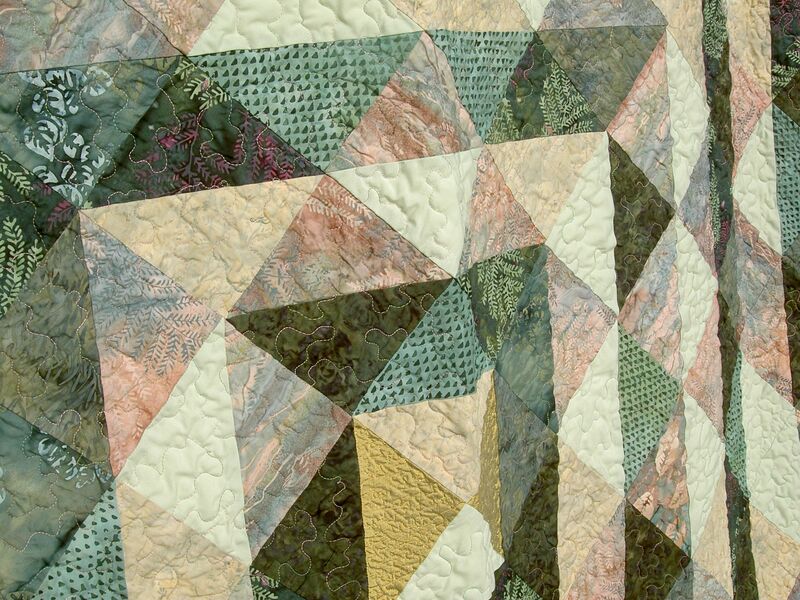 Goodbye quilting, back to writing. But happy weekend all the same! When America wakes up, I’ll see if I can link this up to Amanda Jean’s Friday finish page. 2 Responses to Springtime at last!